Keep your valuables close at hand when you are out for a ride with a motorcycle windshield bag made from waterproof materials. Easy to install on Harleys, Honda & more. 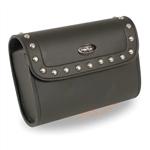 At Leather Bound in New Jersey we have the best selection of windshield bags to attach to your motorcycle. 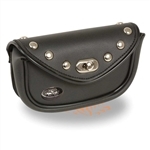 Our motorcycle windshield pouches come in a variety of styles and sizes so every biker is sure to find the perfect bag for their needs. If your in the tri-state area is it worth it to take a ride in to our Pennsauken location where you can try out the bags before you make your purchase so you find the best fit for your needs.